Here at Veeam, we understand how important your data is and how it can affect your organization if it’s unavailable. The link between IT systems and the success of each business, no matter the industry, is undoubtable. Unexpected disruptions come in many shapes and forms, from human error, to malicious attacks, to fire, floods or natural disasters. Having a strong Business Continuity and Disaster Recovery (BCDR) plan can prove vital. But there is more to Business Continuity and Disaster Recovery than meets the eye. BC Planning can help you analyze your infrastructure and detect the threats and weaknesses long before any disaster may occur, while DR reduces stress of the unpredictable and helps you, as well as your organization, become more proactive and open to change and improvement. But what does a strong and efficient BCDR plan look like? Veeam and Conversational Geek joined again and published a mini-series to help IT professionals better understand and easily apply BCDR planning in their day-to-day job. The guides are written in a conversational tone that makes it fun and easy to understand basic principles such as: Mapping IT systems to business function, setting clear RTOs and RPOs and splitting applications into tiers based on how critical they are to the business, create a backup & recovery strategy, adopt the right technology to meet goals. The mini-series offers a good starting point to Business Continuity and Disaster Recovery planning for Health Care, Higher Education and Financial Services. For Health Care institutions, the link between technology and patient care leaves no room for mistakes. Physicians and hospital staff make important decisions based on up-do-date patient information, so a solid BCDR plan is imperative in these organizations. Conversational Business Continuity and Disaster Recovery for Health Care provides best practices and key considerations for creating a solid BCDR plan in a Health Care institution including: Regulatory requirements for patient information, SLAs for each level of applications and documenting your BCDR plan. In Higher Education nearly any loss of service will have a major impact on a school’s ability to function: Registration, on-premises learning management systems and the usual suspects like directory services, email, print services, etc. Should one of the elements fail, it can cause a chain reaction that could seriously affect many users. 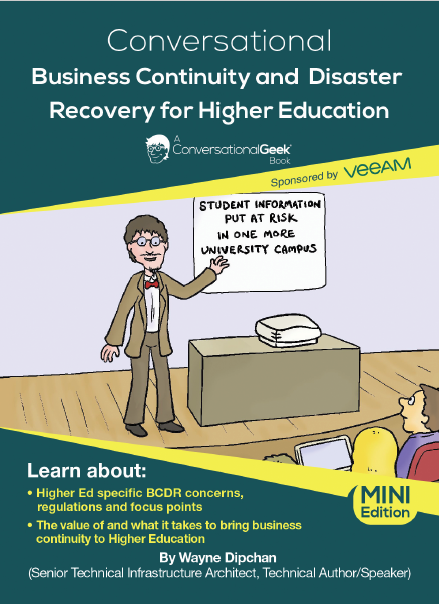 From the Conversational Business Continuity and Disaster Recovery for Higher Education e-book you can get practical tips for a trustful BCDR plan from defining the tiers of apps and services, to testing your plan. Financial Services companies require 24.7.365 Availability and increased attention to security and integrity. IT admins in banks, insurance companies, credit unions etc. are working under the pressure of providing non-stop continuity and defending their data against cyber criminals, while meeting heavy data regulations. Not an easy job, is it? 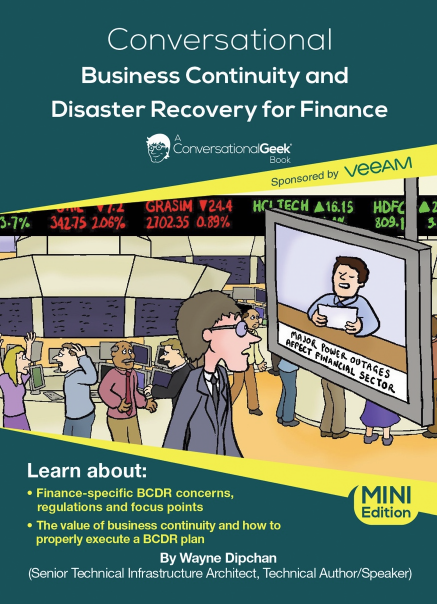 Conversational Business Continuity and Disaster Recovery for Finance e-book provides practical BCDR guidelines for IT professionals working in financial services, including the use of the 3-2-1 backup golden rule and a mix of virtual environment, modern backup & recovery solutions for a powerful IT strategy. To sum up, I believe this series shows that BCDR planning doesn’t have to be a burden, if it’s done the right way. If you don’t find yourself working in one of the above verticals, don’t worry! The main principles of a rock solid BCDR plan work for organizations within any industry or vertical. So to build a business continuity and disaster recovery plan that you are confident in, make sure to respect the following steps: Evaluating the criticality of each application, identifying what technology is needed to achieve defined RTPOs, documenting and testing your plan. 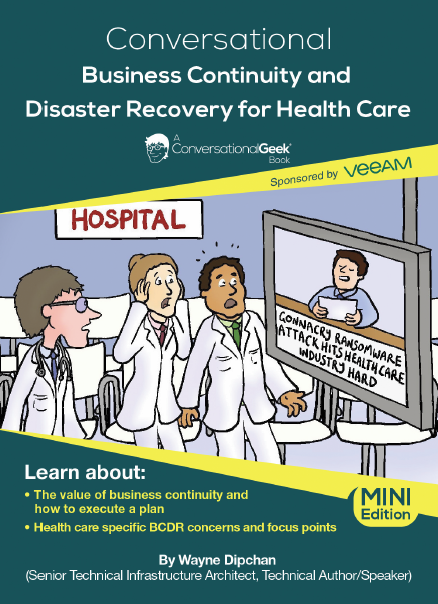 The post Conversational Business Continuity and Disaster Recovery: FREE e-books appeared first on Veeam Software Official Blog.